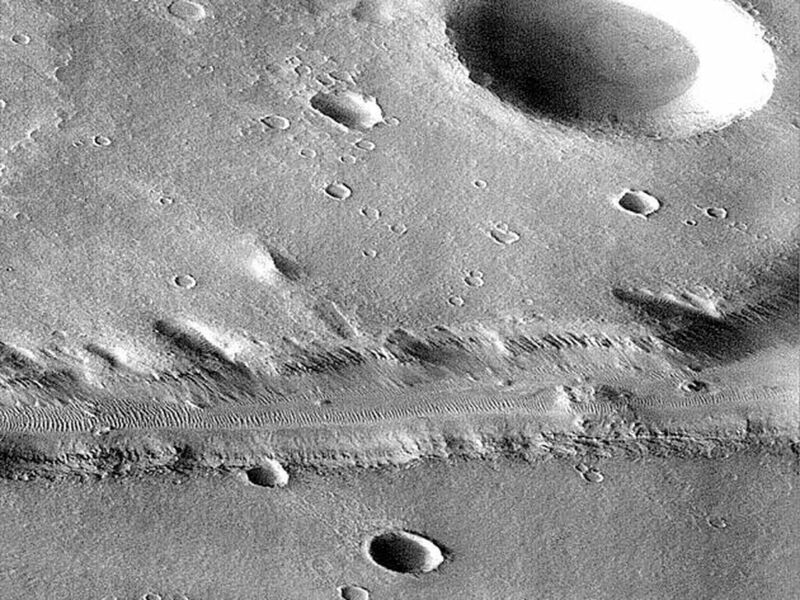 This image is a subsection of the MGS Nirgal Vallis "B" image (PIA00942). This subsection of frame P006_05 is shown here at reduced resolution because the full image is almost 7 MBytes in size. Because the MOC acquires its images one line at a time, the cant angle towards the sun-lit portion of the planet, the spacecraft orbital velocity, and the spacecraft rotational velocity combined to significantly distort the image. However, even in this reduced resolution version, dunes can be seen in the canyon and in areas on the upland surface around the canyon. 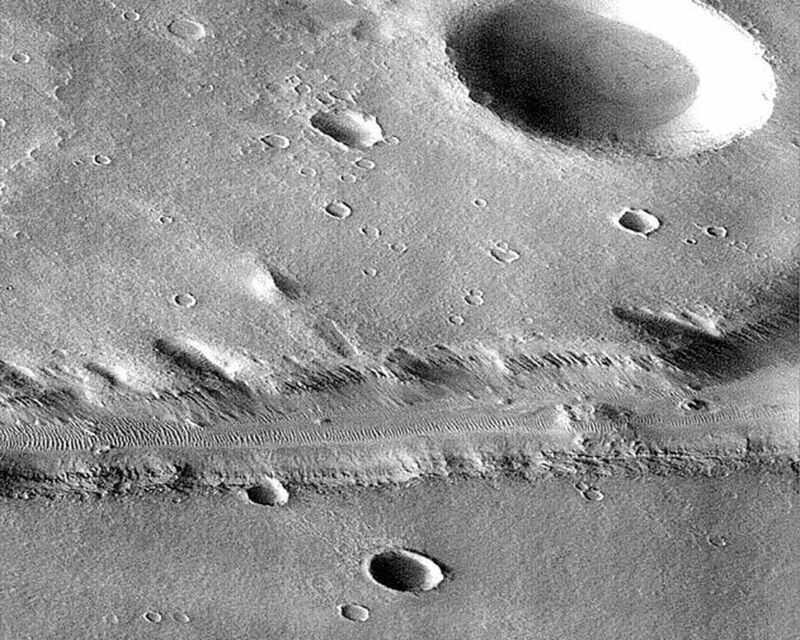 Nirgal Vallis is one of a number of canyons called valley networks or runoff channels. Much of the debate concerning the origin of these valleys centers on whether they were formed by water flowing across the surface, or by collapse and upslope erosion associated with groundwater processes. 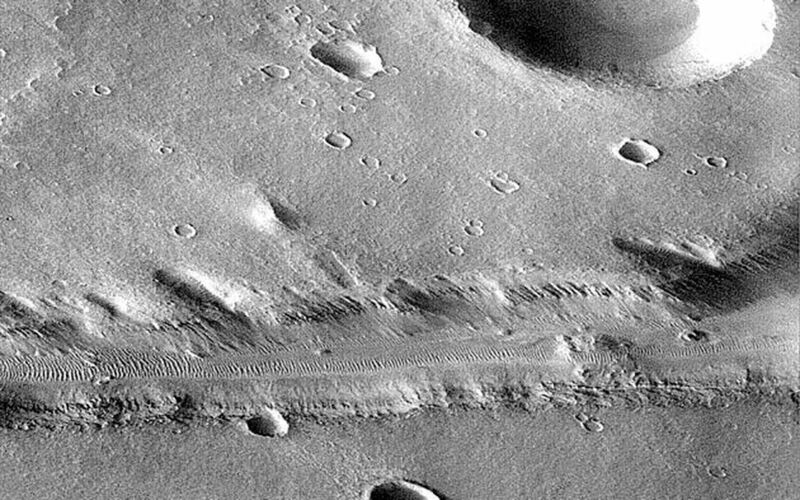 At the resolution of this image, it is just barely possible to discern an interwoven pattern of lines on the highland surrounding the valley, but it is not possible to tell whether this is a pattern of surficial debris (sand or dust), as might be expected with the amount of crater burial seen, or a pattern of drainage channels. With 4X better resolution from its mapping orbit, MOC should easily be able to tell the difference between these two possibilities. Launched on November 7, 1996, Mars Global Surveyor entered Mars orbit on Thursday, September 11, 1997. The spacecraft has been using atmospheric drag to reduce the size of its orbit for the past three weeks, and will achieve a circular orbit only 400 km (248 mi) above the surface early next year. Mapping operations begin in March 1998. At that time, MOC narrow angle images will be 5-10 times higher resolution than these pictures.